Eddie Redmayne may be having the best few months of his life! He just accomplished a major feat in his career by snagging the Best Actor Golden Globe for his role as Stephen Hawking in The Theory of Everything, and he was also nominated for an Oscar and a SAG award. As if that wasn't enough, Eddie Redmayne married Hannah Bagshaw, his longtime love, in December. Because most of Redmayne's career triumphs happened in the couple's post-wedding bliss, we selfishly get to see this adorable couple as they maneuver the flashing lights and red carpets in this new and exciting time in their life. I don't know if any words were actually said. There was just a lot of sort of screaming across the phone... She was so happy. She does a proper job, and she was at home. And she was like, "How am I to go back and do the accounts when I'm so excited?!" OK, collective squees of cuteness, everyone. 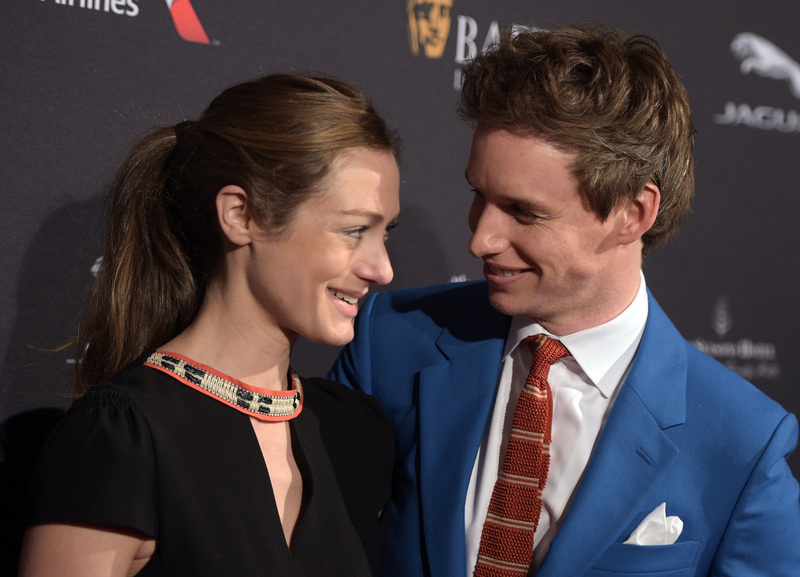 In light of this cute little story, let's recap some of Eddie Redmayne and Hannah Bagshawe's most adorable moments, shall we? I’m confused with colors. When I go out to premieres and events, I have to check with my girlfriend that the trousers match the top. I recently wore a blue suit — and I had to ask her if it was really blue rather than purple. She assured me it was blue. I could not tell the difference. I'm lucky to be with someone who is very supportive. Redmayne went traditional (like Benedict Cumberbatch) and announced his engagement with Bagshawe in print in The London Times. He also asked her father for her hand in marriage before making any plans... what a gentleman! Usually it's so annoying, but sometimes it's just too hard to keep away from each other. Their honeymoon was cut short so they could attend the events, but Redmayne says he promised his new wife of a few weeks "sunshine" and thanked the HFPA for giving them a memorable way to end their honeymoon. Back in November, Redmayne and Bagshawe were planning their wedding right before the busy awards season. He shared with E! Online, "We are in the midst of it all now. The plan is a winter wedding. We're in the thick of that at the moment...We're doing our best...We've planned this long in advance. It's the most wonderful thing. I'm desperate. I'm jumping at the bit. I can't wait to be married." D'AWWWWW.